Phil M0DNY is planning to launch a high altitude balloon or two on Tuesday, July 10 from the Goonhilly Earth Station on the Lizard in Cornwall, nearby to the Marconi Wireless Testing Station. Any help with tracking would be greatly appreciated! We’re currently undecided between morning or late-afternoon. If we go for morning then we may also launch a second later near-identical balloon later in the day. 5m/s ascent, ~35km burst. I’ll post updates in #highaltitude on the day when I can. BBC TV’s Great British Railway Journeys is expected to show former MP for Enfield Southgate, Michael Portillo, using 5.6 GHz amateur radio to bounce a signal off the surface of the moon. 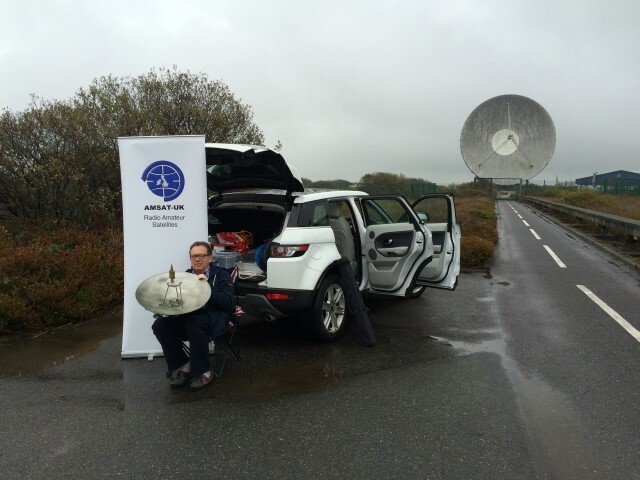 In 2017, a team led by Noel Matthews G8GTZ and Brian Coleman G4NNS made several visits to Goonhilly Earth Station in Cornwall to use the 32 metre GHY6 dish for 3.4 GHz and 5.760 GHz Earth-Moon-Earth (EME) operation. 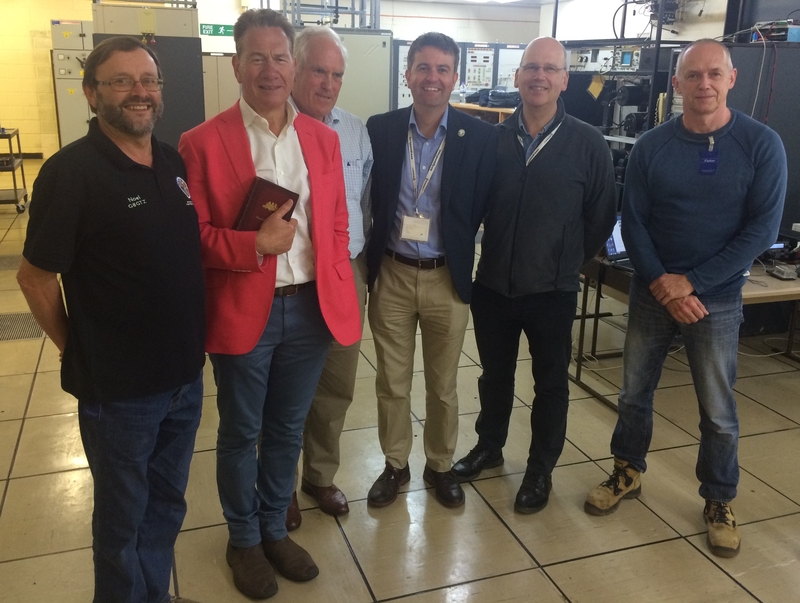 During one of the visits, Michael Portillo and the Great British Railway Journeys team visited and filmed a sequence including EME operation. The show will be broadcast on Friday, January 12, 2018 at 6:30pm on BBC2. Described as “Going to the moon by way of the Cornish Riviera” the sequence will show Michael talking to Brian G4NNS and operating his station under supervision to “talk to the moon” and hear his echos coming back. Steered by his early 20th-century Bradshaw’s railway guide, Michael Portillo boldly goes to the moon by way of the Cornish Riviera Express! On the trail of an historic achievement made at the dawn of the Edwardian era, he investigates the first radio signal to be sent across the Atlantic. In Plymouth, Michael uncovers what happened to surviving crew members of the most famous ocean liner in history, the Titanic. And at Fowey, he rediscovers a lost literary figure known as Q, who immortalised the town in his novels. 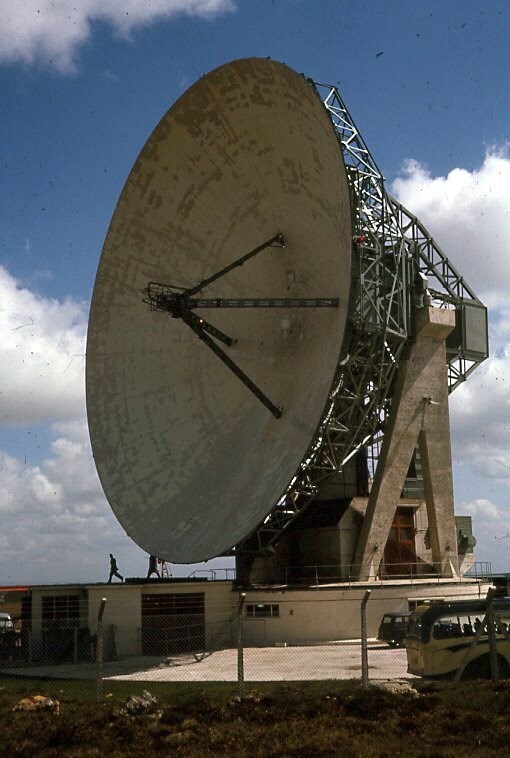 GB6GHY – Hello Moon, this is Goonhilly calling! Noel Matthews G8GTZ of the BATC provides an update on the amateur radio ground station at Goonhilly which will receive video from the ISS during the mission of Tim Peake KG5BVI. Some of you may remember the presentation Graham Shirville G3VZV, gave at CAT15 subtitled “Tim Peake on a TV near you”. Some of you may have also noticed a new station on the Tutioune map located at Goonhilly in Cornwall. This station is using a 3.8 m dish is being loaned to the ARISS project by Satellite Catapult, and will be used to track the ISS and provide real time video during the schools contacts scheduled for early next year. 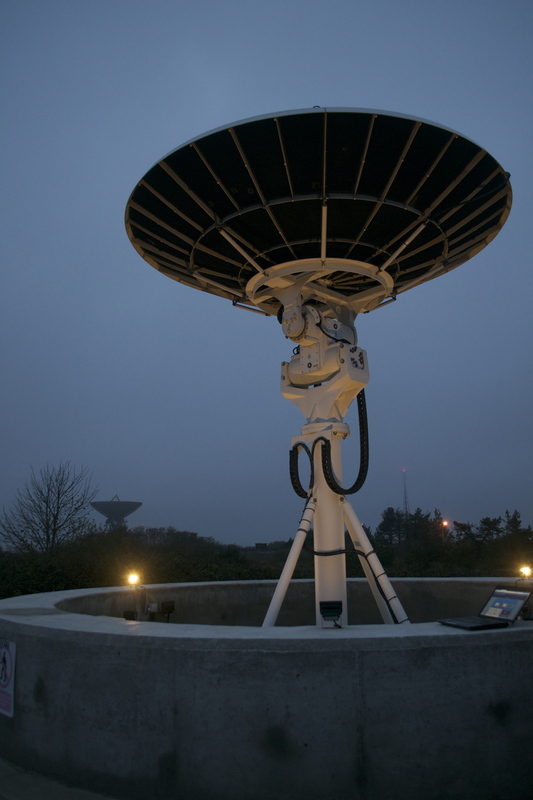 This dish is almost in the shadow of the 29 metre dish built in 1962 to receive the first transatlantic television signals from the Telstar-1 spacecraft. Currently the dish is not tracking the ISS but will be doing so in the near future and will be dedicated to this task for the next 6 months 🙂 In the mean time, the dish is pointing up at 90 degrees (zenith) but the receiver is connected and we received 25 seconds of blank video (visible on the TT monitor page) this morning when the ISS flew over the top of the dish! There will be a full article on the ARISS Tim Peake project in the next CQ-TV along with pictures of the Goonhilly site. 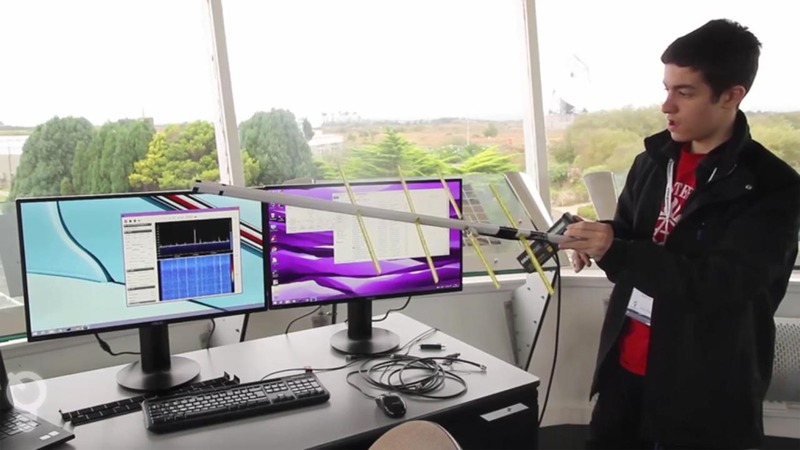 Whilst we were at Goonhilly last week, Graham could not resist seeing if it was possible to receive the HamTV signal using only a handheld 60cms dish and the Tutioune software – much to the team’s surprise Graham was successful and this was the first reception of the ISS at Goonhilly as the equipment had was yet to be installed on the ground station dish! Year 11 students have been spending a week’s work experience at Goonhilly Earth Station learning about radio and satellite receivers. They researched and built a low-cost receiver using the FUNcube Dongle Pro+ Software Defined Radio.